Summary: The South Koreans become as bad as the North, murdering innocent people because they became Party members in order to get food. ‘Tae guk gi’ is the name of the South Korean flag, and Taegukgi is an epic tale of the Korean War from the perspective of two young brothers, JinTae (Jang) and JinSeok (Won). JinTae is a rough diamond who leaves school when his father dies and works as a shoe shine boy to support his mother and save money to send the frail but brainy JinSeok to university, helped by his fiancée YoungShin (Lee). Times are tough, but the family pulls together; sending JinSeok to university is their sole ambition, and they live a simple but happy life. When North Korea invades in the summer of 1951, the South Korean army is caught unprepared and is forced to draft all able-bodied men aged between 18 and 30. In the chaos and confusion both brothers are conscripted by mistake and find themselves at the front. JinTae is determined that he will send his brother home, and makes a deal with the captain of his unit; he will enlist for all the most dangerous missions, and if he can win the Medal of Honour, JinSeok will be released. Naturally he keeps this a secret from his brother, trying to protect him, and JinSeok misunderstands, accusing his brother of falling in love with fame and glory, a dangerous mix of patriotism and vanity. As time goes on, JinTae becomes the perfect soldier; heedless of his own safety, he is battle-hardened, coarsened, brutal, believing his side’s propaganda and dehumanising the Communist North Koreans – for the first time in his life he’s actually good at something. The more sensitive JinSeok tries to remind his brother that the men they are fighting are, for the most part, terrified, unwilling conscripts. The South Koreans are winning the war when the Chinese join in on behalf of the Communists and the South Korean army are forced to flee. JinTae is too busy collecting his Medal of Honour and partying with the men to visit his mother, but JinSeok goes home, where he finds YoungShin. She is just reassuring him that all is well when government officials arrive to arrest her – she is a former Party member. JinSoek tries to defend her, but both are dragged off to the killing grounds. JinTae arrives just in time to stop YoungShin being shot in the back, but a skirmish breaks out and in the crossfire she is killed. Everything that JinTae has believed in is destroyed. 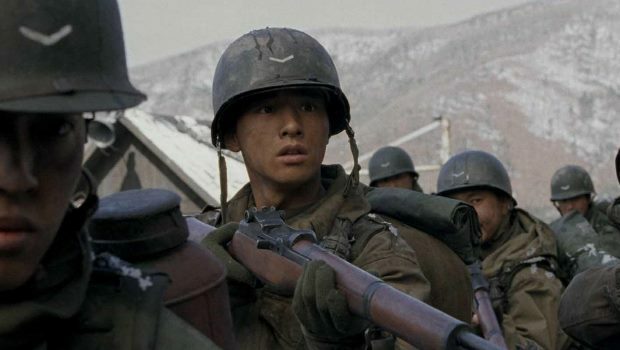 Taegukgi is a sort of Korean Saving Private Ryan, a cerebral war film that shows the senseless nature of war through the eyes of two very different young men. The film employs the same handheld whip pan technique used in the Omaha Beach scenes and also in the battle scenes at the beginning of Gladiator. To start with this was enjoyable and well done but the technique is over-used and becomes somewhat wearisome. The film is very brutal, it doesn’t hold back from showing the strafed limbs of the soldiers, in numbing detail. This may be deliberate, to emulate the effect that war has on those involved in it, but could have been a bit less repetitive. The two brothers are very good, though they don’t look at all alike! But this is a movie, suspend your disbelief. My sympathy was with JinTae, who was really only trying to help his brother and was continually criticised for doing so. He’s caring but inarticulate, incapable of expressing his emotions except through action. He also obviously enjoys for once being better that his brother at something, so he could hardly be blamed for relishing his moment in the limelight. It seemed slightly unbleievable that JinSeok got away with continually barracking his brother and questioning his orders, and never gets punished. The women don’t get much of a look in, which is a pity; more scenes of their suffering at home might have helped to humanise the story, which is a bit relentless in places. The film makes the argument that in war there is right or wrong, only shades of grey; the South Koreans become as bad as the North, murdering innocent people because they became Party members in order to get food. War makes monsters of us all; there is no comforting ‘just war’, no Samwise Gamgee making speeches about there being ‘some good in this world, Mister Frodo, and its worth fighting for.’ Just brother fighting brother, and families torn apart.